Motor Mania Buzz: Audi goes Allroad with A4? It looks like it, judging from these photos. 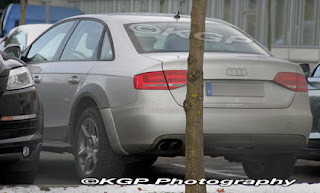 Spy photographers in Stuttgart were baffled when they saw this jacked up Audi A4 sedan. Because the wagon hasn't officially been revealed yet, in the near future we expect to see A4 Allroad mules wearing the wagon bodyshell. The prototype has matte black wheelarche extensions and raised height which are both main components for an Audi Allroad. 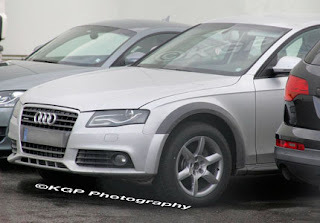 Due to this being a sedan, the A4 Allroad will only be available in a wagon variant. The A6 Allroad was never popular amongst American customers compared to the Volvo XC70 so don't expect to see this at your local Audi showrooms in 2009. The A4 wagon is set to make a world debut at the Geneva motorshow in March 2008.